The selfie brigade, the shameless self-promoters, the spoiler-posting Netflix ruiners, the #blessed: for some people, getting seen on Facebook is (unfortunately) all too easy. Which seems all-the-more unfair if you’re a brand on Facebook, where the organic reach of your posts is likely on a downward spiral, and getting genuine engagement on even your paid posts is tough. But don’t start writing off Facebook as marketing channel quite yet: indeed, according to research by Shopify, the majority of orders from social media (around 85 per cent) come from Facebook, and it boasts some of the highest conversion rates of all social networks. As with most aspects of ecommerce marketing, the key to winning at Facebook is getting exceptional content in front of right person at the perfect time in their buyer journey. Striking a balance between the end goal (selling stuff) and not annoying your fans and followers with overly promotional posts can be tough, especially since Facebook announced a crackdown on organic posts it deemed to be too salesy back in 2014. Here are some brands that are doing it well. Womenswear brand Olive has struck upon a winning formula with its themed posts showcasing the retailer’s beautiful clothing ranges. there’s a clear aspirational element to these posts; that you’re buying into a certain image when you buy Olive clothing. Makeup brand Bobbi Brown created the ingenious international-themed campaign below for the launch of its Lux Lip collection. It’s a great example of skillful content marketing - creating something that’s interesting and shareable above and beyond simply promoting the product. It makes good use of Facebook’s album feature, giving viewers a nice little preview of the first four pictures in the series. Each caption refers to the name of the lipstick featured to make it easier to find in-store (though a direct link would be even better!). New brand on the block Finery uses sponsored Facebook posts to get its products in front of those that are already fans of the page. Finery’s post makes great use of Facebook’s ‘product ads’, which let users scroll sideways through a series of images, each with an accompanying call to action to ‘shop now’. The ad really succeeds at introducing you to the new brand - giving you an idea of the kinds of clothes it sells and their price point, and also introduces a free shipping deal to tempt you in. Mix up your visuals: You’ve doubtless heard it before, but imagery is everything when it comes to creating Facebook posts that get likes, shares and clicks. Ditch the traditional catalogue-style product photos (that your customers are used to and may tune out of) in every post and mix them with lifestyle imagery displaying your products in context, customer-generated pictures, or video. 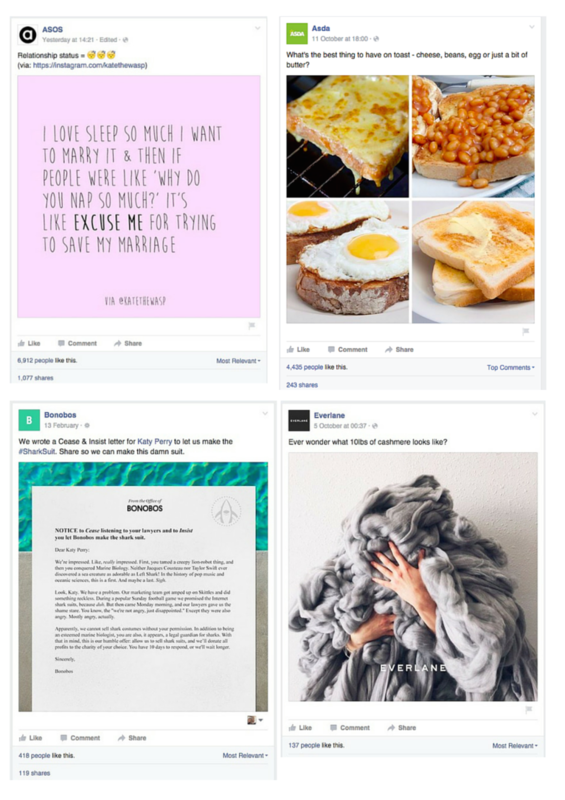 Experiment with format: Facebook offers a range of options for formatting your posts - play around with them to see which gets the most engagement (photo albums, product ads, single pictures, video). Get the size of your photos right: it may sound nit-picky, but getting the size of the images for you Facebook posts right is an important factor in capturing browsers’ attention (see the image below for a bad and good example). Read this great post by the guys over at Buffer for how to format your images correctly. Get curating, BUT...: related to the first point, creating edits that contain a number of your products in one post can be a great way of piquing the interest of shoppers (and upping average order value while you’re at it). Nonetheless, ensure that you have a corresponding landing page on your site where they can find all of items featured in your post easily, else your hard work will go to waste. Lookalike audiences and increasingly sophisticated demographic targeting are enabling online retailers to laser-target their customer acquisition efforts on Facebook. But getting in front of the right person is only half the story: getting the content right is vital. Eve produced the ad below to catch the eye of would-be mattress shoppers. The tone of this promoted post is perfect for introducing the brand new prospects - it doesn’t assume any prior knowledge of what Eve is about and includes a number of key messages - about what the brand makes, about its delivery and returns policy and its home trial. The guys over at Birchbox have created the ad below, which is targeted specifically at acquiring more student customers. The copy has a strong tone of voice and introduces the Birchbox model in a clear but fun way. It contains clear calls to action that are all aligned (become a ‘subscriber’, sign up etc.). It has a bright, eye-catching image. Tone: Think carefully about the tone of your sponsored posts in relation to the customer lifecycle if you’re targeting people who are new to your brand. Ensure that the copy conveys key messages, and doesn’t assume any prior knowledge of your brand and what you sell. Images: In the same way, use images that really sell your brand image. Consider consulting your customer data to see which products attract your best customers and feature these in your ads. Competitions can be a great way of sparking brand interaction on Facebook, but designing them so that they attract potential customers and foster loyalty can be tricky. The good folk over at AO have been shaking up the white goods market for a while with their fun, down-to-earth approach to marketing. The Facebook post below advertises a GBBO-related competition, giving followers the chance to win kitchen appliances for sharing pictures of their baking. AO takes the time to interact with people in the comments section, making it seem personable, building affinity with customers. By encouraging people to upload their own photos to the comments section, AO creates a lot of community engagement, with people commenting on and liking the various entries. Topman created a series of posts and a Facebook app to accompany the launch of its collection with Radio 1 DJ Nick Grimshaw, encouraging entrants to submit their own animal doodles to win their creation printed on a shirt. AS with AO, the promotion and accompanying posts encourage users to get creative and really engage with the brand. Topman posts the promotion as the page's cover photo, making it the first thing that casual browsers of the company's page see. The post uses really strong visuals, including pictures of the man himself. Competitions 2.0: ‘share this post for a chance to win!’-type posts are old hat these days and tend to attract an army of competition seekers instead of potential customers. Devise competitions that entertain and challenge those that enter. Social proof: encouraging entrants to be creative makes them more likely to want to share their creations with their friends - great for spreading the word about your brand. Interacting with customers: responding to customer comments (even if they are negative) is an important part of creating a strong Facebook community. Getting seen: With declining organic reach, you need to use every opportunity you have to get your competition posts in front of people. Consider creating a cover photo or ‘pinned’ post for your giveaways to get it in front of more eyeballs. Many online retailers are enthusiastically embracing content marketing, and Facebook can be an excellent channel for getting brand’s content in front of fans. But getting people to click through from the network to your blog or on-site content can be a tricky task. River Island created a ‘masterclass’ series in which it invited YouTube sensation Jim Chapman to share his favourites. It links to a dedicated landing page where viewers can snap up the pieces in Jim’s edit. It’s genuinely helpful and interesting, giving tips on what’s going to be big in the new season rather than being a hard-sell for River Island clothes. The post ticks all the boxes when it comes to content sharing best practices - a strong image and an irresistibly clickable description. Get the basics right: content distribution is something that a lot of brands still struggle with - make sure that you spend time selecting good imagery and writing persuasive copy, and the clicks will come rolling in. Capitalise on the networks of celebrities you work with by tagging them in your posts and encouraging them to share it too. Last but not least, we’ll turn our attention toposts intended to achieve virility. These types of post are perhaps the hardest to get right, and require an in-depth understanding of your target market and what gets them going. They’re also the trickiest to measure, as they’re less likely to link or relate directly to your product offering. The ASOS post is funny, laser-focused at the brand's target demographic and highly shareable. The Asda post encourages conversation, asking the simple question that attracted over 3,000 comments. The Bonobos post is timely and amusing, latching onto news story about the dancing shark at Katy Perry’s superbowl performance. The Everlane post uses the brand's product, but in an interesting rather than sales-y way. Know your audience: Easier said than done, we know, but the only way of fostering virility in your posts is by sharing things that strike a chord with your fans. Social listening tools like Brandwatch can help you understand more about your followers' other interests, and remember to try out different ideas and formats to see what gets the most engagement. It's okay to repurpose great content from elsewhere that your fans will love: just remember to attribute it to the original source!